Maryland’s new "red flag law" has gone into effect and supporters predict that it will save lives. ANNAPOLIS, Md. — Maryland’s new “red flag law” has gone into effect and supporters predict that it will save lives. The law allows people to ask a judge to remove guns from anyone deemed a threat to themselves or others. The protection orders that allow the courts to demand someone surrender their firearms only lasts for up to one year. Maryland Delegate Geraldine Valentino-Smith said the law, which was Senate Bill 707, gives people an ability to do more than offer thoughts and prayers in the aftermath of gun violence. “This is prayer-plus,” she said. 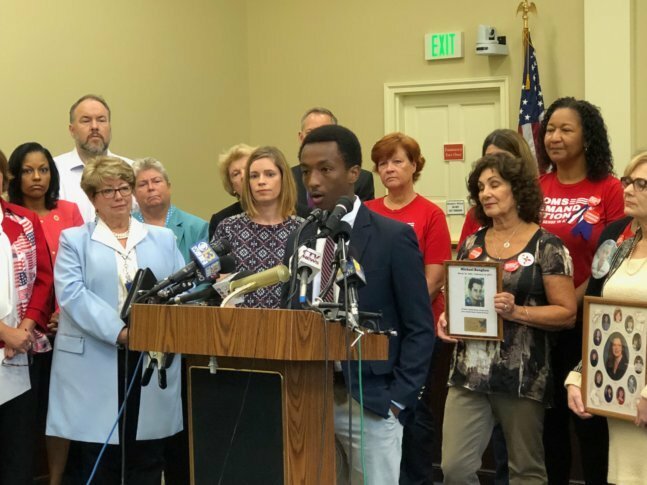 At a news conference in Annapolis, lawmakers and advocates who supported the bill as it moved through the legislative process emphasized that it could prevent suicides as well as mass shootings and domestic violence. Dorothy Paugh, who lost both her father and her 25-year old son to suicide, explained why she fought so hard to see the bill passed into law. “I pushed for this for the 250 plus people in Maryland every year who shoot and kill themselves,” Paugh said. Montgomery County Sheriff Darren Popkin said educating the public on how the law works will be important. He also believes 9-1-1 calls will drive requests for the red flag protective orders that will allow judges to temporarily take guns away from anyone deemed a threat to themselves or to someone else. “Many of these will come from 9-1-1 calls when someone is in some sort of crisis,” Popkin said, basing that on law enforcement experience in California where 190 of the first 200 extreme risk protection orders were issued based on 9-1-1 calls. Michael Solomon, 16, attended the news conference in Annapolis. He’s co-president of MOCO Students for Change and a junior at Springbrook High School in Montgomery County. “I must say that watching these new regulations go into effect today is extremely inspiring,” Solomon said. “We’re showing the world that we have not forgotten Parkland, we haven’t forgotten Great Mills and we haven’t forgotten Las Vegas,” he said in reference to a string of mass shootings across the country, including the one that killed 58 people in Las Vegas a year to the day before the red flag bill went into effect. There have been questions about whether the red flag bill as enacted could have prevented some of the shootings that happened in Maryland after the bill was passed in the last General Assembly session in Annapolis. If any gaps become evident, “We will make those fixes in the next session, if they’re needed,” said Jen Pauliukonis, president of Marylanders to Prevent Gun Violence.